The Coming of the railway to Launceston | Launceston Then! The Launceston and South Devon Railway. Exeter and Plymouth Gazette April 9th 1836. The next project was one of Mr. (afterwards Sir) Goldsworthy Gurney, inventor of tho ” Bude Light,” who in 1841 started a scheme for a railway from Launceston to Plymouth on the atmospheric system (tried by Brunel on the South Devon line between Newton Abbot and Exeter and ultimately abandoned). A company was formed, of which Mr. Charles Gurney, of Trebursye, Town Clerk, and Mr. John Ching were the chief promoters, but, though many shares were taken up in the town and neighbourhood, much opposition was shown to the scheme. Mr. William Arundell Harris Arundell, of Lifton Park who was the foremost opponent, called a meeting in the Central Subscription room, which proved to be one of the most heated known to have been held in the town, finally degenerating into the bandying of personalities ; but the discussion had the effect of causing this project also to collapse. Mr. Arundell’s main objection to it had been that its adoption would be a block to a central line from Exeter through Launceston to the West, and three years later, when the Rev. Edward Rudall (of Boyton) proposed with others the making of a line from Launceston to Doublebois, Mr. Gurney strongly opposed it on the ground his old antagonist had taken against the atmospheric scheme, and carried his audience with him when a meeting was held in the Central Room on the subject, with the consequence of this collapsing also. It was possibly advantageous in hindsight that there was a delay in the former scheme considering the proposal for the atmospheric system which could quite likely have caused a huge financial burden for the fledgling railway. Exeter and Plymouth Gazette December 21st 1844. 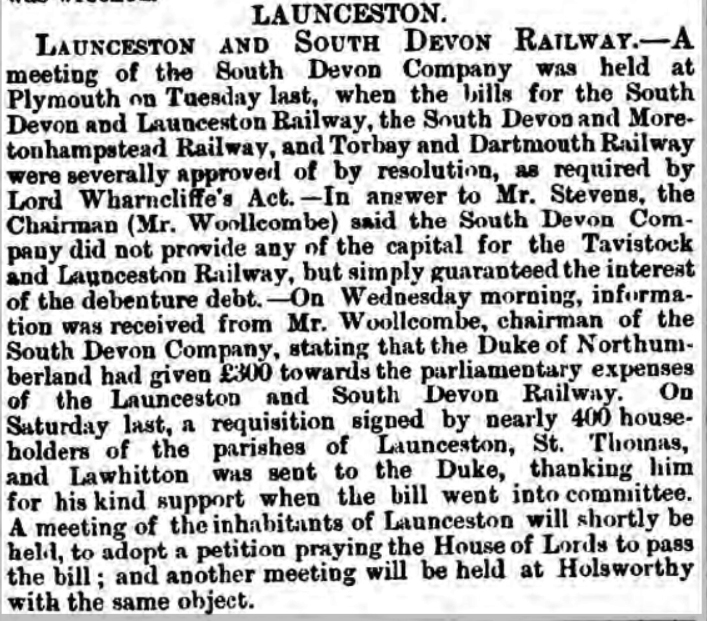 1845 opposition to a railway for Launceston. 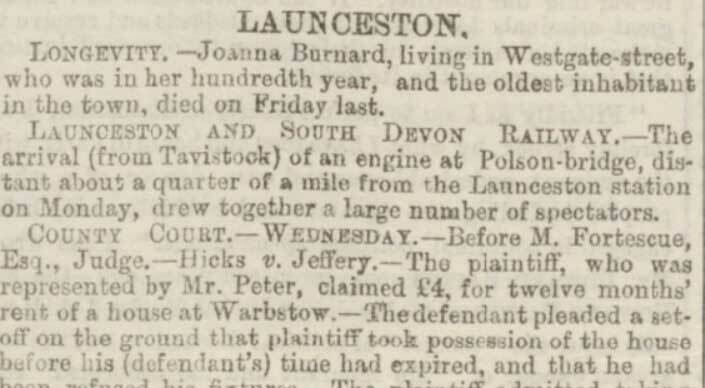 However, strong sentiment remained within in Launceston and its district that it should be connected to the national railway system so on Monday the 21st of October 1861 a public meeting convened by the then Mayor John Doidge, was held at the Western Subscription Rooms at 3:00pm. Being chaired by Major Edward Archer the discussion was centered on the construction of a broad gauge railway line from Tavistock to Launceston (Launceston and South Devon Railway) to join up with the already constructed Plymouth to Tavistock line. Much was made of previous schemes that were rejected in 1845 and 1846, such as the central Cornwall line that would have driven from Bodmin across the moor to Altarnun and then onto Exeter via Launceston. After some three hours of debate the resolution to accept the plan was carried with just one dissension. Some opposition to the scheme from the general public remained as this enlightened letter in November 1861 proves. received at Twinaways on the Tavistock road, and drawn by hand into, what was described at the time, the gaily- decorated town. On June 9 an open-air concert was held on the Walk to celebrate the victory, and when, on the last day of the month, the royal assent was given to the measure a railway to Launceston was secured. It wasn’t until June of 1863 that work began with Peter J Margery being appointed engineer and John Fowler as consulting engineer. Due to favourable weather conditions during the spring of 1863, good progress was made with the very good weather that summer, however the winter of 1864 -1865 was particularly bad and held up the works for several weeks. With the Towns people eagerly waiting the railway, there was great interest in its advancement. The placing of the girders into position over the Tamar at Polson and the appearance of the first engine on its trial run in May 1865 were keenly followed. On Thursday the 1st of June 1865 the Terminus was duly opened to great relief. A special train of 15 coaches hauled by 2 South Devon Railway ‘Hawk’ class locomotives arrived to a tremendous applause in torrential rain at Launceston Station. The line didn’t open to the public until a whole month later, after Colonel Yolland the Board of Trade Inspector had passed it fit to operate. South Devon Railway ‘Hawk’ class locomotive at Launceston on June 1st 1865. In the Royal Cornwall Gazette of last week we gave a brief account of the opening of this line, which took place on Thursday, with great ceremony. Before detailing the proceedings at the opening we will give a short description of the line: The Launceston Railway is a continuation of the line from Plymouth to Tavistock, and commences at the east end of the Tavistock Station (left). Near to the Station the line crosses the Plymouth road over an iron girder bridge (from which there is an excellent view of Tavistock) and a little further on it passes through a hard rock cutting, called Green’s Hill, which is 100yards long, and 50feet deep, and thence across a viaduct, the five piers of which are built of rock faced masonry, and are distant from each other fifty five feet, over the turnpike road, a foundry yard, and the river Tavy. The length of the structure is about 240 feet. The line proceeds on an embankment, close by the Duke of Bedford’s model cottages, at the end of which it runs for nearly a mile and a half through fields situate between the river Tavy and the Okehampton road. This road being diverted near Half-bridge, and carried by a stone bridge over the line at a great expense. The old road ran on a level with the line, and the new road had to be gradually raised until it reached the required height of the bridge. As there was no cutting near from which to obtain the material for making the embankment, land had to be purchased for the purpose. From this bridge the line leaves the valley of the Tavy, runs for some distance by the river Burn, and along the bottom of the Rigworthy Vale, where the Mary Tavy station, distant 3 ½ miles from Tavistock, is situate. The village from which the station derives its name is about a mile off, and is not visible from the railway. There are copper and tin mines in the neighbourhood, the most noticeable of which is the Wheal Friendship Mine, celebrated for the depth and extensiveness of its working and the immense size of its waterwheels. The line continues over the valley, passes Brentor and then on for a mile or two across a large common, bordering Dartmoor, called Black Down, where stands the Lydford station, distance 3 ¼ miles from Mary Tavy, and rather more than one mile from the village of Lyford. At this point of the line the intended junction with the Okehampton railway will be made. In the attractive neighbourhood of Lydford may be seen the ancient remains of Lydford Castle, the place where stannary courts were formerly held, where they used to “hang and draw” offending persons, and where the approved fashion of the present day is to “sit and draw” the romantic scenery of Lydford Bridge, the beautiful fall of the river Lyd (80 feet perpendicular) Brentor Church etc. in close proximity also is the much admired Tavy Cleave. At Lydford station the “summit” is reached, the line rising nearly all the way from Tavistock. Between these two places the steepest gradient is 1 in 74. 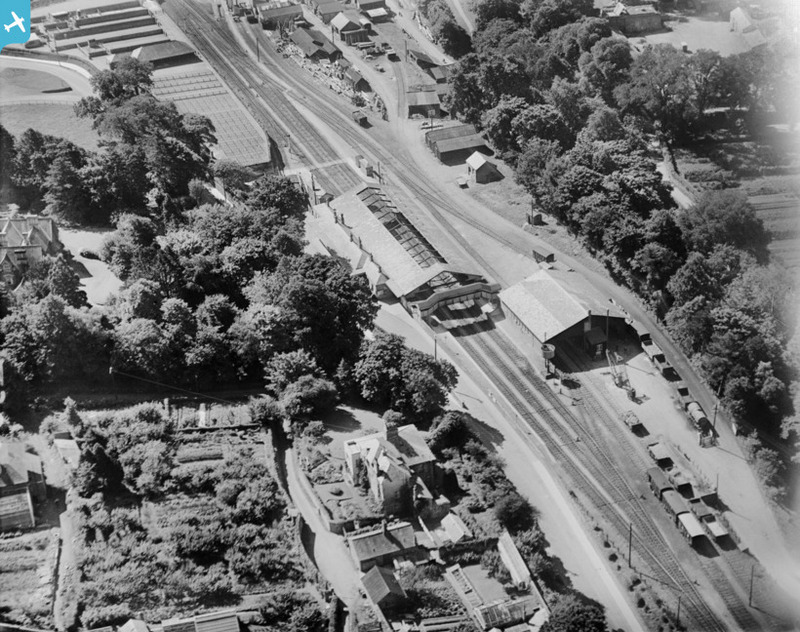 Lydford station is 370 feet higher than the station at Tavistock. From Lydford it is a decline almost all the way to Launceston. On this part of the line there are several deep cuttings and high embankments. Between Westford and Burnell the works have been very heavy, the line passing through cuttings 40 feet deep and over banks varying from 50 f.t to 95 ft. high. The scenery through which the line passes in this part of its route is exceedingly picturesque. The next station is a mile from the village of Coryton. It bears the name of that place, and is distant from Lydford station four and half miles. After leaving this station the line presently enters the beautiful grounds of Sydenham House, the residence of J. Tremayne Esq. It was originally intended for the line to run through a tunnel some distance off, but the contractors and Mr. Tremayne came to a satisfactory arrangement. From this spot the line runs almost on a level through the valley of the Lyd to Lifton station which is distant from the town about half a mile, and from Coryton three miles and a quarter. Just beyond the station an expensive bridge has been erected for the purpose of the lime quarry, the company having taken the road formerly used. At the near Lifton quarry the works have been very costly in protecting the line against floods of the river Tamar. The railway passes through the centre of Lifton Park, the seat of H. Bradshaw, Esq., on to Polson Bridge, where the Tamar is crossed by a wrought iron bridge, which has four openings. From this bridge the line traverses up the Mackinsy valley from whence there is a fine view of Launceston, the Castle, Werrington Park, and St. Stephens Church, to Launceston station, the distance to which from Lifton is about four and half miles. From the bridge at Polson the line rises with an inclination of 1 in 126 until it reaches Launceston. The total length of the railway is 18 miles 75 chains. At Launceston the line is 76 feet below the level of the line at Tavistock. There is a level crossing at Lifton, and it is the only one. The line was commenced in June 1863. Its entire cost has been about £11,000 per mile, the requisite capital being secured by 18,000 shares at £10 each. The stations have a neat appearance, and are fitted up with every accommodation. The one at Launceston, the builder of which is Mr. Burt, of St. Stephens, nearly approaches completion. The entrance to the station is where recently stood a dwelling house belonging to Mr. Trist. A steep hill separates the station from the main part of the town. The contractors of the line are Messrs York and Co., and the engineer is J. F. Featherstonhaugh, Esq., under whose direction the line has been constructed. D. G. Grose, Esq., is the resident engineer. It need not be said that the railway will give an impetus to trade, and proves a great benefit to the district. The full report and speeches in pdf. Cornwall Railway Societies Plymouth to Launceston Route in photos. From the speeches made at the dinner is quite clear that there was an overall relief that the town was now connected to the railway network, albeit by the broad gauge system which was to cause its own problems over the coming years. 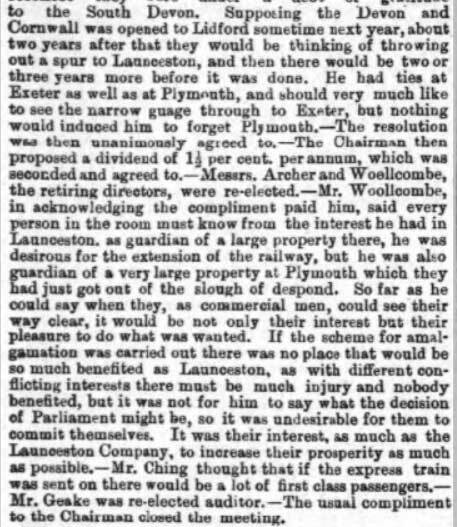 Colonel Archer , chairman of the Launceston and South Devon Railway company, also made mention to the distractions and problems in bringing forth the line, taking a light hearted opportunity to knock back the lines detractors. It is clear that the companies directors were not as such chasing the investment in monetary terms, but more for the good of the Town, and because of this, a great deal of expectation was being placed in the lines future prosperity. In June there was also a motion to build a link from the Bude -Launceston canal at Druxton Wharf to the new station. But this never got past the planning stage and the canal unable to compete with the railway was closed in 1891. Company ; in the next year another Act changed the name to the Central Cornwall Railway Company, and allowed it to extend itself to Truro ;while a third Act in 1867 gave it still further powers, which have never been executed. Undeterred by this, a Devon and Cornwall Railway Company was incorporated, which in 1873 secured an Act for an extension to Holsworlhy and Camelford, and to the Launceston and South Devon Railway, but this also fell through ; and a prominent townsman, who had whimsically vowed never to take milk in his tea until a central line should be made, died without his hope having been accomplished. The Launceston and South Devon Railway Company remained independent until 1873 when it was amalgamated with the South Devon Railway Company. 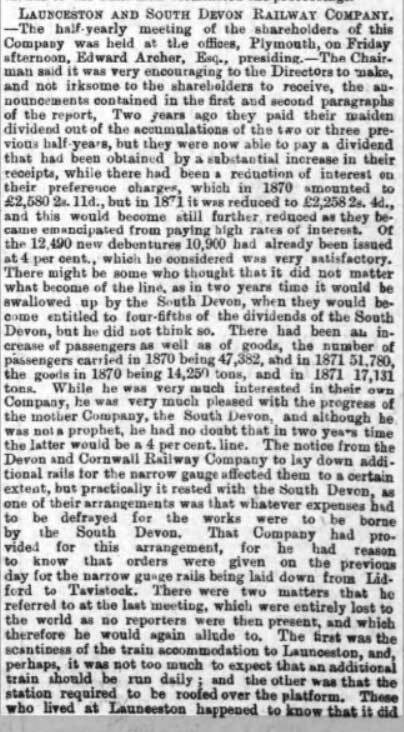 The South Devon Railway ‘s dalliance with Brunel’s ill fated atmospheric railway from Exeter to Totness in 1847 nearly bankrupted the company and from then onwards always struggled financially . 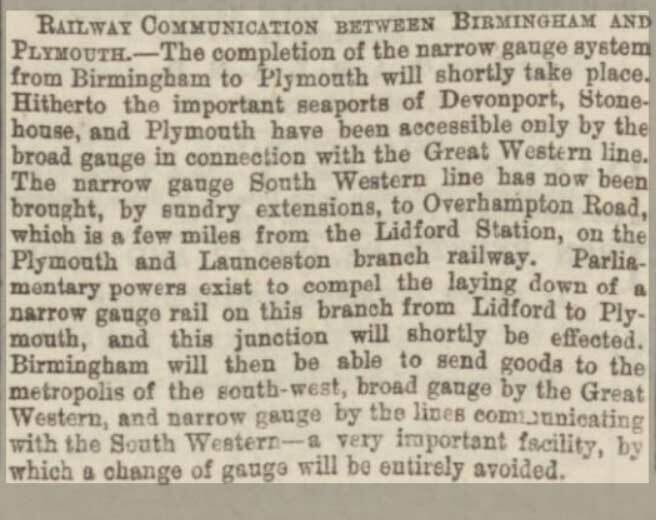 The London and South Western Railway’s opening of a competing route between Exeter and Plymouth in 1874 prompted the South Devon Railway to seek a merger with the Great Western Railway in 1876. Western Company frustrated the scheme. The South Devon Railway Company were strictly of the broad gauge, so it was destined for the Launceston and South Devon line to follow that prescribed gauge. However, just as we witnessed the fight between Betamax and VHS in video standards some 100 years later, the same battle was fought over Broad gauge and Narrow gauge. In the act that permitted the building of the Launceston and South Devon railway, there was a clause inserted that stated provision must be made to lay a narrow gauge track alongside the broad gauge track from Lydford to Plymouth, should as proposed, the London and South Western Railway Company connect their line from Okehampton to Lydford. 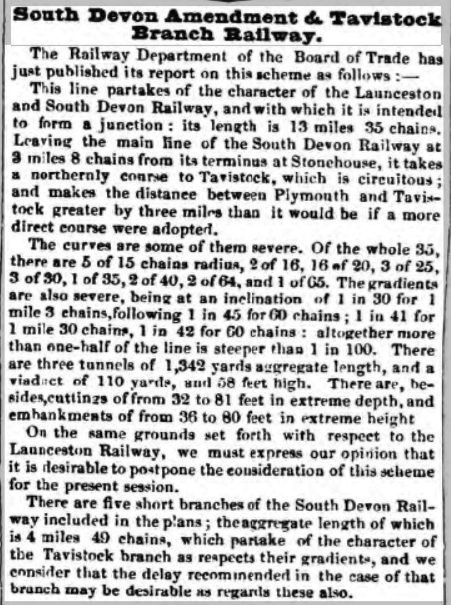 This connection of lines duly happened in 1874 so the South Devon Railway co. were then obliged to run a mixed gauge track as per the act. At the half yearly meeting of the Launceston and South Devon Railway Co. the matter of the gauges were raised initially by the chairman Colonel Archer and subsequently by Mr. Ching who had hoped to have heard something of the narrow gauge being extended to Launceston. 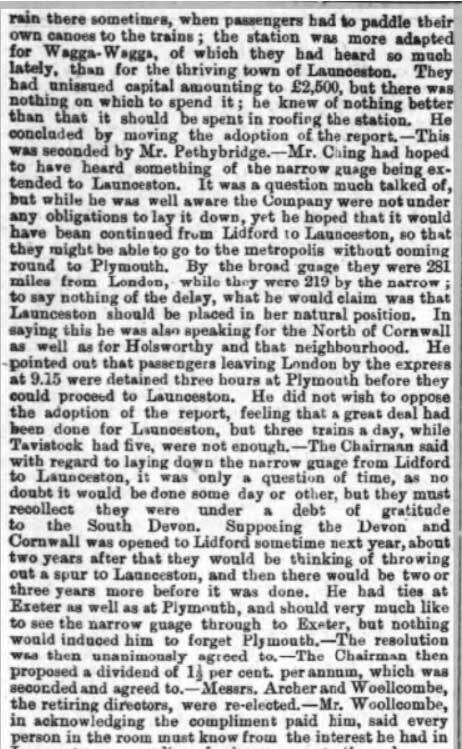 He understood that the South Devon Railway Co. were under no obligations to lay it down, but he had hoped that it would have been continued from Lydford to Launceston so that they might be able to go to the metropolis without coming to Plymouth. By the broad gauge they were 281 miles from London, while they were 210 by the narrow. The Colonel Archer felt in his opinion that it would only be a matter of time before the adoption of the narrow gauge towards Launceston but he wanted to remind the board that they owed a debt of gratitude to the South Devon for all that that company had done in bringing the railways to Launceston in the first place and the matter was dropped. However in early august 1877 the mood had changed and the people of Launceston and its district were demanding that the line be changed to the narrow gauge system and so on a Tuesday morning on the at the western meeting rooms the railway commissionaires, Sir F. Peel, Mr. Price and Mr. Miller, QC., Attended an inquiry into the application made by the residents to the Board of Trade, to compel the Great Western Railway Company to allow a third rail to be laid on the line from Lydford to Launceston, in order that Launceston might thus be placed in full connection with the narrow gauge system throughout England. The commissionaires hear overwhelming evidence to back up the claims form numerous residents including some prominent businessmen. The meeting was adjourned until October when more evidence could be heard. That meeting never took place and although the GWR were pressed on the subject, they were far from encouraging and the matter was allowed to die. 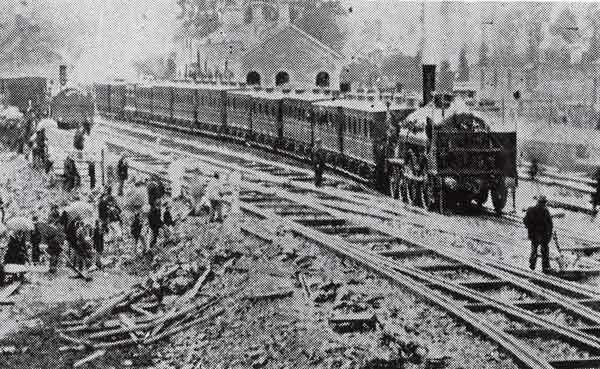 It wasn’t until May 1892 that the line was eventually converted to narrow gauge, completed over the weekend of the 21st and 22nd but by this time the North Cornwall Railway (L. & S. W. R.) had already brought narrow gauge to Launceston and by the more direct route of Okehampton via Hallwill Junction.